The collapse of the European empires at the end of World War I produced considerable political strangeness. Béla Kun. The Czech Legion in Siberia. The Bavarian Soviet Republic. Baron Ungern. Flights of fancy, seizures of power, and some powerfully fancy seizures. 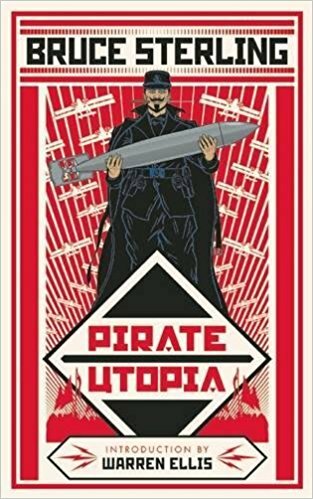 In Pirate Utopia, Bruce Sterling sails off to another corner of collapsing empires rubbing up against barely victorious powers: the city of Fiume, which had been Austrian before the war, promised to Italy during hostilities, and awarded to the future Yugoslavia at the peace conference. Enter Gabriele D’Annunzio, an Italian poet, journalist, playwright, daredevil fighter pilot during the war, and adventurer afterward. He parlayed pre-war literary fame and further glory gained as a daring flyer against Austria’s forces into leadership of a troop of roughly 2000 irregulars who protested the peace conference’s award of Fiume to Yugoslavia by marching on the city and forcing out the Allied garrison. D’Annunzio tried to attach the Fiume and surroundings to Italy, but the Italian government was having none of it. Spurned, D’Annunzio proclaimed an independent state, the Regency of Carnaro. Sterling picks up the story of the Regency, mashes it up with some plausible alternative events, and puts it all into overdrive with the energy and polemical voice he poured into the Viridian Green art movement. 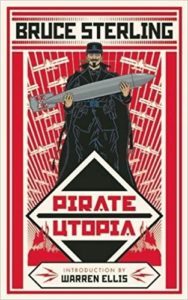 John Coulthart’s design and illustrations aid and abet Sterling’s piratical pillaging of history, dressing the tale up in Futurist garb and reminding readers that the revolutions of the early 20th century aimed to sweep art and technology along with them, and not merely power and politics. In our world, the Regency turned out to be a dress rehearsal, in several senses of the phrase, for Italian Fascism. D’Annunzio proclaimed himself Duce; he and his legionnaires set up a corporatist microstate. In Pirate Utopia, D’Annunzio goes by one of the nicknames he had in history, “The Prophet.” He is surrounded by an improbable cast that includes The Ace of Hearts, Lorenzo Secondari (the Pirate Engineer), and Blanka Piffer (mad dictator of her Torpedo Factory). They are trying to make revolution, they are trying to revolutionize technology, they are trying to bring justice. They are also trying to stay on top, keep their several lovers, and do it all with style. The story itself is relatively brief, a bit more than 150 smallish pages with plenty of whiz-bang Futurist graphics. In revolutionary style, gestures stand in for longer scenes, and much of the action is implied. Then Houdini shows up, with H.P. Lovecraft and Robert E. Howard in tow; an escape is not the only magic he proposes. The future looks bright!